The Roman god of wine, Bacchus, has organized three great Bacchanalias to be held in his honour. He has given his satyrs the enviable task of recruiting nymphs to come to these wild parties. These lovely ladies dress very colourfully and love to romp and cavort with the satyrs... an oh boy, do they love to party! 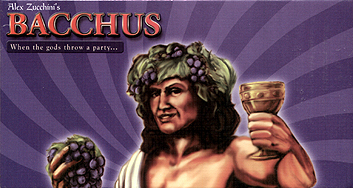 As a player, you are one of Bacchus' satyrs. Your task is to gather together as many like-dressed nymphs at the Bacchanalias as possible, driving up the point value of these stylish nymphs and scoring as much as possible in the process. So party on, you insatiable hoofed ones, all in the name of Bacchus!